RideMakerZ is an interesting thing. It's not a specific RC car. It's not even just an RC car maker. It's more of an experience. The way you get a RideMakerZ vehicle is to go to one of their stores (located in malls across the United States), or to their website, and start picking out parts to create your own custom car or truck. You start by picking a body from one of about 15 styles ranging from race car to construction truck, you pick a color, then you start choosing details like chassis style (street or monster truck) wheels, tires, and other add-ons. The standard type of RideMakerZ vehicle actually isn't even radio controlled -- you choose whether you want your car to be freewheeling or an RC. Different parts like wings, ground effects, and hood scoops attach with screws or magnets, and whether you're at the store or online, a RideMakerZ mployee will happily take care of the details for you. In all, there are supposedly 649 million different unique combinations of parts that can be put together, so it's easy to create something that's truly one of a kind. Three radio frequencies are selectable on each car, so you can race against friends. Building a RideMakerZ vehicle for you can involve a lot of steps, but once you own it, preparing to drive is a piece of cake -- just pop in your alkaline batteries and you're ready to go. There's even a rechargable battery set available, but at an additional cost. When you first turn on a RideMakerZ RC, the working headlights & taillights blink and sounds come from the car to let you know that it has come alive. This is really classy and fun. You can push on a button on the hood (or on the hood scoop, if you have one) to play a brief music track. When you start driving forward, the headlights come on, and they're very bright and realistic. In reverse, the taillights shine. For its size, a RideMakerZ car is very heavy, so it's slow to accelerate. It goes pretty fast, though, and has good steering. The tires not only look good, but they stick to the ground pretty well, too. The ability to customize your own RC vehicle & get exactly what you want, even down to small details, is absolutely awesome. What's not so hot, though, is the price of these things. The very cheapest possible RideMakerZ setup with an RC chassis is about $55.00 US, plus taxes, without batteries. For a car that's about 10" long, has no suspension, and accelerates slowly, that's really not a good deal at all. At that price, it should at least include a rechargable battery pack, with a charger. When you start adding accessories & custom upgrades beyond the most basic parts that come with the original chassis, the price goes up very quickly. 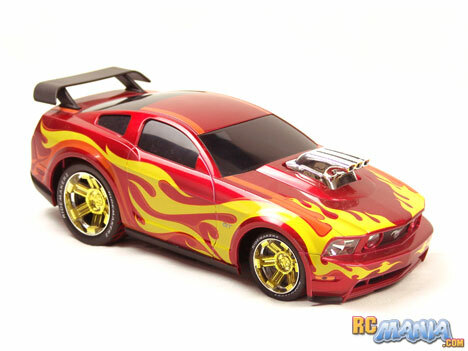 The flame-red Mustang GT I got included a hood scoop, custom wheels, and custom tires, and those pushed the cost over $75! That's highway robbery! It's no wonder that shortly after I bought this car online, I learned that some RideMakerZ stores are starting to go out of business. The products are cool, but nobody should pay such crazy high prices! Unless you can find a used one for cheap, or you are really rich, I'd recommend passing on "theze."